Very Very Vicky: Lord Willing and the Creek Don't Rise! Lord Willing and the Creek Don't Rise! My last post was July 31st! We had just closed on our new little old Tybee Island cottage. live in a different town. Finally, in late September my turn was drawing near to begin the work and I was eager to get started. I hoped to get the heavier work done before Christmas. At the same time a tropical storm named Matthew was being followed with interest by the weather forecasters. Then it turned into Hurricane Matthew, a category 5 storm in the eastern Caribbean. It impacted Haiti, Cuba and the Bahamas before it took aim for the southeastern United States. When and where would it make landfall? Would it go to the Gulf coast or come up the eastern shore? Will my house make it through? Such are the nail-biter questions owners of coastal properties ask. The mayor had ordered a mandatory evacuation of Tybee Island before the storm came but there were some "hurricane holdouts" who sheltered in place and thanks to them posting videos on Facebook we were able to see that our cottages, including the one awaiting restoration, had survived! A couple weeks later after the flooding had subsided and the utility crews had made things safe and restored services, I went for a firsthand look with my sister Crystal who was visiting me. 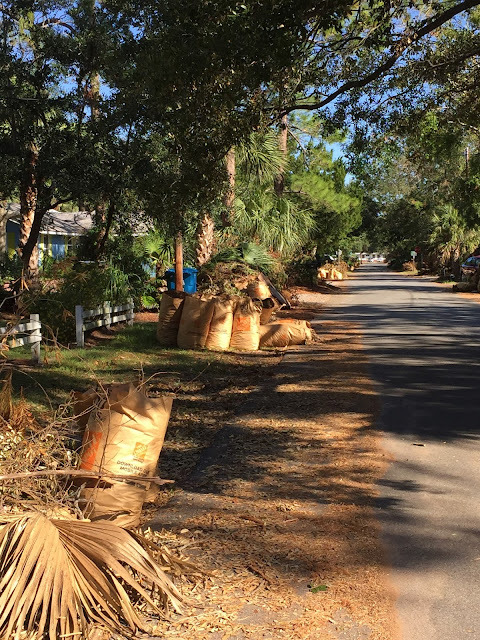 Full-time residents had been at work clearing debris from the yards and there were huge piles of yard trash, stacked logs from fallen trees, and in some cases, furniture which had been soaked and was no longer desirable. Our completed cottage, Doc Holiday, is a raised cottage and did not suffer any lasting impact even though the lot was flooded several inches. 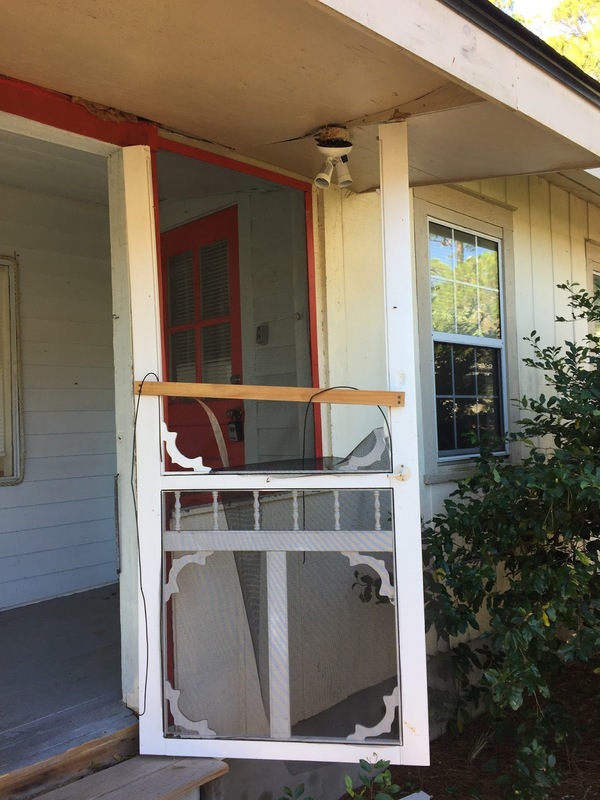 It also had one very beaten up screen door from the high winds. But I'm so grateful that that was the extent of the damage! Well...I'm happy to say that my turn has come back around and I am very excited to get down to business! Can't wait to share it all with you! "Before" At The Beach Part Two! Foggy Photos Not To Be Mist--Ha!